For those of you strong enough to do a bit of food-based detox, here’s a simple recipe, courtesy of Amanda Goodwin. 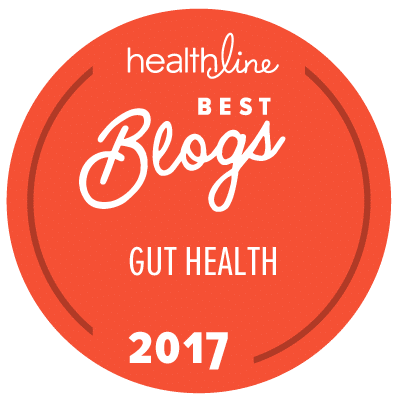 Although it’s best for people with Crohn’s, colitis or any kind of immune system challenge to avoid grains, I know that sometimes that’s not always possible, or your body can’t tolerate enough other foods to cut out grains. So this is one of the better ways to eat a high protein grain. Soak quinoa in water 1 – 8 hours* in water and 1 teaspoon of apple cider vinegar. Wash, rinse and drain. Place quinoa in a 2-qt pot (or rice cooker), add 2 cups of water (or bone broth) and salt. Bring to a boil, lower heat and simmer with lid on until all water is absorbed (about 15 minutes). Don’t stir the grain while it is cooking. Test for doneness by tilting the pan to one side, making sure all of the water has been absorbed. Remove lid and let rest 5 to 10 minutes. Combine remaining ingredients in a large bowl. Toss well. Serve warm or at room temperature. Note: Liquid measurements tend to be approximate as it depends a lot on how strong the cooking heat is. It may be a good idea, especially for those not accustomed to cooking grains, to lift the lid and check the water level halfway through cooking and again towards the end. Also tasting the grains can help you see if they are fully cooked or starting to burn. 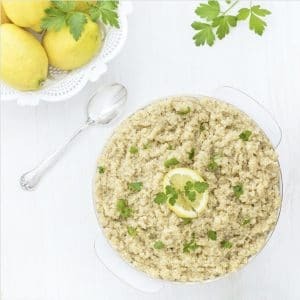 *I do want to point out that minimizing the phytates in grains is pretty crucial for ongoing health and to do this properly you need to add either an acid (like lemon juice or vinegar), or liquid whey (strained off live yoghurt) while the quinoa is soaking. It’s also best if you soak the quinoa for a minimum of 12-24 hours, and then rinse off the soaking water before cooking it. Detailed instructions are here. The good thing about this recipe is that the Vitamin C in the lemon juice (aside from helping with detox) also helps the body to handle the adverse effects of phytic acid. Bone broth helps with this too, so use broth (rather than water) to cook the quinoa, if you can. When I have quinoa, I like to have it with sliced avocado, some hummus, olives, maybe some diced chicken or wild salmon, and whatever veggies I have on hand. Yum! We cook and eat quinoa like many other grains, but, botanically speaking, it’s a relative of spinach, beets and chard. The part we eat is actually the seed, cooked like rice, which is why quinoa is gluten-free. You can even eat the leaves!